Making adjustments to medications in accordance with eating and exercise habits is key. 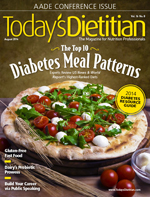 Jack, a middle-aged man with type 1 diabetes, started a low-carbohydrate diet to lose weight. In the first few days of his new diet, he experienced the shaking, sweating, and mild confusion that frequently accompanies hypoglycemia, which is typically defined as blood glucose levels less than 70 mg/dL. Jack didn’t know that by consuming less carbohydrate than usual, he’d need to take less insulin. Maura, a woman in her early 30s with type 2 diabetes, takes glyburide to control her blood glucose levels. She began an exercise program to lose weight in preparation for her sister’s wedding. Three weeks into the program, she started experiencing hypoglycemia. To avoid this, she began eating a carbohydrate-containing snack before and after each workout. The calories from her snacks, however, exceeded the calories burned during exercise, so her weight slowly increased. She considered giving up exercise. Maura’s friend Lisa also has type 2 diabetes but controls her blood glucose with metformin. Maura advised Lisa to eat a large carbohydrate-containing snack before exercise, so she did. Losing weight and keeping it off is difficult for most people, but those with diabetes of any type have additional challenges. They need to consider how changing their eating and activity habits may affect their blood glucose levels, explains Patti Urbanski, MEd, RD, LD, CDE, one of the authors of the recent American Diabetes Association nutrition position statement and a diabetes educator on the Fond du Lac Reservation in Cloquet, Minnesota. Insulin and medications that increase insulin levels in the blood raise the risk of hypoglycemia (see table below). Therefore, individuals taking these medications may need to measure their blood glucose more frequently, Urbanski says. In addition, they may need medication adjustments when they lose weight, increase physical activity, or change their diets, and they will need to know the signs and symptoms of hypoglycemia and its appropriate treatment. Not all blood glucose–lowering medications promote hypoglycemia when used as monotherapy. In fact, rarely do medications not listed in the accompanying table cause hypoglycemia. Ideally, patients, guided by a health care team member, should be able to proactively reduce medications as necessary to avoid hypoglycemia. Keeping food, activity, and blood glucose records can provide the necessary information to make sound decisions about treatment changes, says Linda Delahanty, MS, RDN, chief dietitian and director of nutrition and behavioral research at Massachusetts General Hospital Diabetes Center in Boston. For instance, Jack worked with his health care team to reduce his mealtime insulin to better match his carbohydrate intake. Maura’s health care provider also reduced her glucose-lowering medications. Maura worked with a certified diabetes educator and RD to learn about appropriate snack choices and ideal timing of meals and snacks. Lisa was surprised to learn that taking metformin put her at low risk of hypoglycemia, and that she probably didn’t need a snack immediately before exercise. To ensure safety, dietitians should advise people at risk of hypoglycemia to carry a carbohydrate source and, if possible, their blood glucose meter while exercising. Dietitians also should tell patients about typical hypoglycemia symptoms, including shaking, nervousness, irritability, sweating, chills, and dizziness.1 Appropriate treatment for mild to moderate hypoglycemia involves consuming a measured amount of glucose (see “The Rule of 15” sidebar below). In addition, patients should wear a medical ID bracelet or carry identification stating they have diabetes. Hypoglycemia can occur several hours or even a day after exercising, so additional blood glucose monitoring is indicated. Conversely, some people experience hyperglycemia after intense bouts of activity, says New York-based dietitian Susan Weiner, MS, RDN, CDE, CDN, author of The Complete Diabetes Organizer. People with diabetes also may have other health concerns, such as comorbidities or complications that contraindicate certain types of physical activity or require specific modifications. For example, patients with proliferative retinopathy or moderate or severe nonproliferative retinopathy may need to avoid lifting weights and placing their heads below the level of their hearts to prevent intraocular bleeding, retinal tears, or retinal detachment. It’s prudent to have patients seek clearance from their health care providers before they begin an exercise program, Delahanty says. In general, adults with diabetes are encouraged to perform at least 150 minutes of moderate-intensity aerobic activity each week, spread over at least three days with no more than two consecutive days without exercise.2 In the absence of contraindications, adults with type 2 diabetes also should perform resistance training at least twice weekly. Dietitians can assure overweight and obese patients that losing even a few pounds can result in meaningful improvements in blood glucose and other health parameters. In fact, losing as little as 2% of body weight can benefit glycemic control, Delahanty says. Losses of 5% to 10% of body weight are associated with significant improvements in blood glucose, blood pressure, and lipids with fewer medications needed to treat these cardiovascular risk factors. Other benefits include improvements in sleep apnea, knee pain, physical functioning and mobility, urinary incontinence, depression, and quality of life, she adds. In some patients, weight loss and increased physical activity can induce either partial or complete remission of type 2 diabetes, Delahanty says. In the Look AHEAD study that examined more than 5,000 overweight or obese people with type 2 diabetes, 11.5% of participants in the intensive lifestyle intervention arm achieved complete remission, defined as normal blood glucose levels with no medications, or partial remission, defined as blood glucose levels in the prediabetes range with no medications.3 Remission rates were higher in those who achieved the greatest weight loss and fitness improvements, had diabetes for a shorter time, had lower initial body weight, had better initial glycemic control, and didn’t take insulin, Delahanty says. Patients need to know that type 1 diabetes won’t go away with weight loss. Type 1 diabetes is an autoimmune disease, Weiner says, and currently there’s no cure. However, if patients with type 1 diabetes are overweight or obese, weight loss may reduce the amount of insulin they need for blood glucose control. Is There an Ideal Weight-Loss Diet? The two studies reporting the greatest weight loss at one year used different approaches. The Look AHEAD trial reported an average weight loss of 8.6% of initial body weight and used a calorie-controlled plan, meal replacements, and physical activity.3 A study using a Mediterranean-style eating pattern with no more than 50% of calories from complex carbohydrates reported losses averaging 6.2 kg (13.7 lbs).6 “The ideal eating pattern for achieving weight loss is one that’s reduced in calories and considers each individual’s typical eating patterns, food preferences, and metabolic goals, and at the same time is a sustainable way of eating rather than a short-term diet that relies on willpower,” Delahanty says. By paying special attention to the risk of hypoglycemia and other concerns unique to people with diabetes, dietitians can individualize care to help them lose weight and live healthier lives. — Jill Weisenberger, MS, RDN, CDE, FAND, is a freelance writer and a nutrition and diabetes consultant to the food industry, including Daisy Brand Cottage Cheese and Good Fats 101. She has a private practice in Newport News, Virginia, and is the author of Diabetes Weight Loss — Week by Week and the forthcoming The Overworked Person’s Guide to Better Nutrition. — Source: Garber AJ, Abrahamson MJ, Barzilay JI, et al. AACE comprehensive diabetes management algorithm 2013. Endocr Pract. 2013;19(2):327-336. • 1 cup nonfat or low-fat milk. Wait 15 minutes after treating before eating anything else or resuming activity. Consume an additional 15 g of carbohydrate if blood glucose remains low. Continue this procedure until blood glucose normalizes. 1. Hypoglycemia (low blood glucose). American Diabetes Association website. http://www.diabetes.org/living-with-diabetes/treatment-and-care/blood-glucose-control/hypoglycemia-low-blood.html. Updated May 20, 2014. Accessed May 23, 2014. 2. American Diabetes Association. Standards of medical care in diabetes. Diabetes Care. 2014;37(1):S14-S80. 3. Delahanty LM. The Look AHEAD study: implications for clinical practice go beyond the headlines. J Acad Nutr Diet. 2014;114(4):537-542. 4. Feldstein AC, Nichols GA, Smith DH, et al. Weight change in diabetes and glycemic and blood pressure control. Diabetes Care. 2008;31(10):1960-1965. 5. Evert AB, Boucher JL, Cypress M, et al. Nutrition therapy recommendations for the management of adults with diabetes. Diabetes Care. 2013;36(11):3821-3842. 6. Esposito K, Maiorino MI, Ciotola M, et al. Effects of a Mediterranean-style diet on the need for antihyperglycemic drug therapy in patients with newly diagnosed type 2 diabetes: a randomized trial. Ann Intern Med. 2009;151(5):306-314.